In contrast, most of the Arctic sea ice exists inside the Arctic Circle and should be last to melt. However during the Arctic’s coldest winters, Barents Sea ice still melts deep inside the Arctic circle. While cold March air temperatures maintained maximum ice further south in the Hudson Bay and Bering Sea, much of the Barents Sea has been ice-free. In 2012 the more southerly Bering Sea ice set records for maximum extent, similar to the maximum sea ice currently observed in the Antarctic. Clearly global greenhouse gases cannot be the cause of melting inside the Arctic, while simultaneously sea ice is expanding in the Bering Sea and the southern hemisphere. However ocean currents and natural ocean oscillations readily explain such behavior. Counter to the media hype, it is Antarctic sea ice that should be the most sensitive indicator of climate change caused by greenhouse gases because the Arctic sea ice is affected by too many other confounding factors. In contrast for millions of years the Antarctic Circumpolar Current (ACC) has created a formidable barrier that prevents any similar warm water intrusions. (The ACC is discussed further at the end of this essay). Therefore changes in Antarctic sea ice are not confounded by warm water intrusions, making Antarctic sea ice a better indicator of the effects of rising CO2 concentrations. Due to the constraints of the continents, the maximum extent of Arctic sea ice in 1979 covered about 15 million square kilometers. In contrast, Antarctic sea ice is unconstrained by continental boundaries and each winter winds blowing from the cold Antarctic interior push the sea ice much further towards the equator. By September the sea ice covers 16 to 17 million square kilometers of the Antarctic Ocean, nearly 40% of the southern hemisphere’s ocean surface. Because sea ice is less likely to be piled against a shoreline to form thicker multi?year ice, most of the Antarctic sea ice is relatively thin, first-year ice. 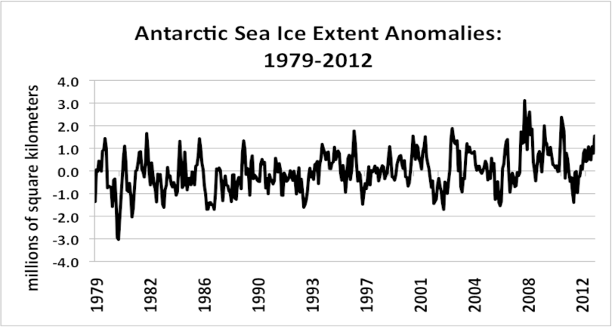 Despite more extensive winter ice, each summer Antarctic sea ice retreats much more rapidly than Arctic sea ice. Antarctica’s first-year ice can quickly shrink to a less than two million square kilometers. Even during the Arctic’s “historic” summer lows of 2007 and 2012, the Arctic still retained more sea ice than the Antarctic. Climate scientists acknowledge that due to Arctic Oscillation’s natural variability, “detection of possible long-term trends induced by greenhouse gas warming [is] most difficult.”3 Therefore because the confounding percentages of trapped multi-year ice fluctuates greatly in the Arctic, trends in Antarctica’s sea ice are again a much cleaner indicator of global climate change. 3) There is so much warm, salty Atlantic and Pacific water lurking just 100 meters below Arctic Ocean’s surface, that it could melt the winter ice completely several times over. As climate scientists noted, “There are arguments in support of an important role for oceanic heat in shaping the Arctic pack ice. They are often keyed to the presence of warm intermediate-depth (150–900 m) water of Atlantic origin”3 Sea ice insulates the ocean surface from the stirring effects of the wind that will raise those warmer waters from intermediate depths. However once the insulating layer of ice is removed, the formation of thicker ice is delayed because the winds will now stir and raise warm subsurface waters. 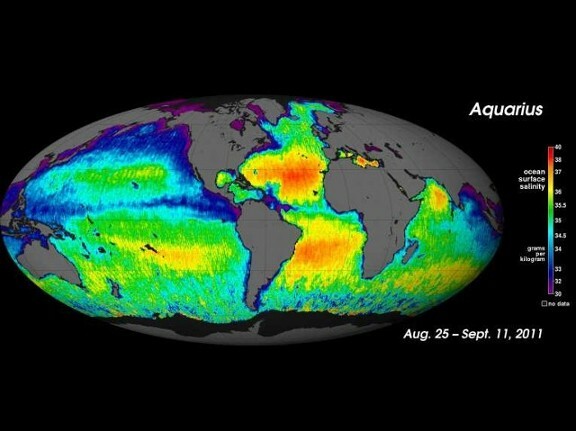 For example even when the Pacific Decadal Oscillation shifted to its cool phase and the volume of intruding Pacific water was reduced, the stirring effect of the winds still caused greater summer melt.6 Global warming advocates argue that the lack of Arctic sea ice amplifies the warming of the Arctic Ocean and accelerates the los of sea ice. They argue without summer ice to reflect the sun, the waters will continue to warm. However if that dynamic was so important, it should be happening in Antarctica as well. But it is not. 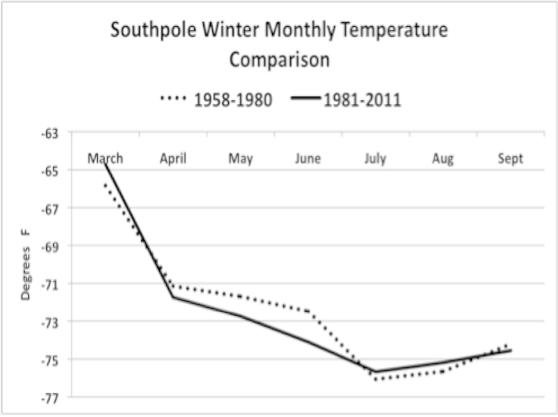 Similarly if we examine winter air temperatures over the South Pole where ventilated heat from the ocean is not a factor, again there is no warming trend (Figure below). In fact there is a slight cooling during the months of April, May, and June which is consistent with the increasing Antarctic sea ice. Oddly, Mann did not address the changes in intruding warm water or the Arctic Oscillation and Pacific Decadal Oscillation (PDO). It was the greater volume of warm water that had passed through the Bering Strait that had caused the extensive loss of sea ice in the Chukchi Sea in 2007 resulting in the historic summer low. But all that is now changing. Mann’ alarming trend of rising Alaskan temperatures has already reversed with the shifting to the PDO cool phase and Alaska is becoming the most rapidly cooling region on the globe, cooling by 1.3°C for just the recent decade.9 As the PDO trends to its cool phase and less Pacific water enters the Chukchi Sea, its sea ice is also recovering. Likewise the Barents and neighboring Kara Sea are most affected by warm intruding Atlantic water, but as the Arctic Oscillation trends negative, less Atlantic water is pumped towards the poles. The 2013 increase of Kara Sea ice is likely a result. Unlike the Arctic, Antarctic waters are not so affected by cycles of intruding warm water, and its growing sea ice suggests that rising greenhouse gases exert a very trivial effect. As the Pacific Decadal Oscillation and Arctic Oscillation shift to their cool phases and solar activity wanes, natural climate cycles predict that Arctic sea ice should recover within the next 5 to 15 years. Climate models have demonstrated that Arctic sea ice can recover in just a few years after the winds change.7 Allowing for a lag effect as subsurface heat ventilates and thicker multiyear ice begins to accumulate, recovery could be swift. If so, CO2 advocates like Mann and his allies who have based their political and scientific authority on predictions that Arctic Sea Ice will disappear by 2030 will likely suffer embarrassing unprecedented scientific and political repercussions. Antarctic Circumpolar Current’s (ACC) oceanic barrier was first established when continental drift separated Antarctica from the other continents several million years ago. This allowed an unimpeded flow and the ACC became the world’s greatest and most powerful current, moving a hundred times more water than all the earth’s rivers combined. As it strengthened and isolated the seas inside the ACC, Antarctic waters cooled dramatically. Inside the ACC species requiring warmer water soon became extinct, and the ACC still maintains a formidable thermal barrier that has thwarted invasions by cold-blooded marine species. Since its establishment, true sharks, true crabs, and some families of barnacles are uniquely absent inside the ACC, and many of Antarctica’s remaining cold-blooded species are found nowhere else. In contrast, the Arctic Ocean has been invaded by many North Atlantic and Pacific species that can persist at lower depths in warmer subsurface waters that circulate throughout the entire Arctic. The ACC’s thermal barrier is also why the Antarctic pack ice symmetrically extends far beyond the Antarctic Circle (Figure 1). 1. Kahl, J., et al., (1993) Absence of evidence for greenhouse warming over the Arctic Ocean in the past 40 years. Nature 361, 335 – 337. 2. Venegas, S. A., and L. A. Mysak, 2000: Is there a dominant timescale of natural climate variability in the Arctic? J. Climate, 13, 3412–3434. 3. Polyakov, I., et al., (2010) Arctic Ocean warming contributes to reduced polar ice cap. Journal of Physical. Oceanography, vol. 40, p. 2743–2756. doi: 10.1175/2010JPO4339. 4. Rigor, I.G. and J.M. Wallace (2004), Variations in the Age of Sea Ice and Summer Sea Ice Extent, Geophys. Res. Lett., v. 31, doi:10.1029/2004GL019492. 5. Rigor, I.G., J.M. Wallace, and R.L. Colony (2002), Response of Sea Ice to the Arctic Oscillation, J. Climate, v. 15, no. 18, pp. 2648 – 2668. 6. Shimada, K. et al. , (2006) Pacific Ocean inflow: Influence on catastrophic reduction of sea ice cover in the Arctic Ocean. Geophysical Research Letters, vol. 33, L08605, doi:10.1029/2005GL025624. 7. Tietsche, S.,et al. 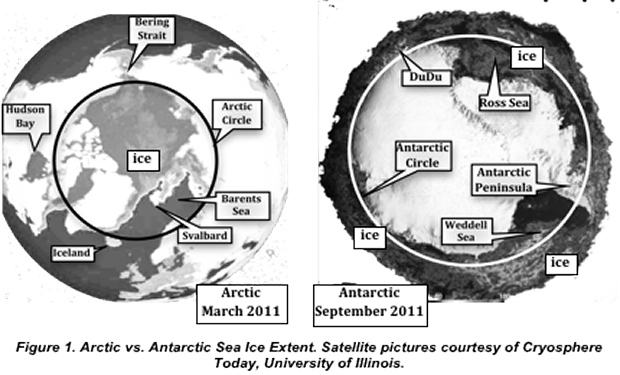 (2011) Recovery mechanisms of Arctic summer sea ice. Geophysical Research Letters, vol. 38, L02707, doi:10.1029/2010GL045698. 10. Landrum, L., et al. (2012) Antarctic Sea Ice Climatology, Variability, and Late Twentieth-Century Change in CCSM4. Journal of Climate, vol. 25, p. 4817?4838. 1. Why has all the media attention been focused on melting Arctic sea ice ? 2. How can CO2-induced warming melt Arctic sea ice but increase Antractic sea ice? 3. If more freshwater in the Antractic oceans causes ice to form more quickly, why isn't Arctic sea ice growing? 4. How do scientists separate rising temperatures caused by ventilated ocean heat versus contributions from CO2?